The Department of Education (DepEd) celebrated the National Teachers' Day at Ormoc City Superdome. Education Secretary Leonor M. Briones in her message assured the teachers of more opportunities for their personal and professional growth, for their welfare and financial management, for review and simplifying systems and processes, among others. The Secretary with those opportunities the teachers are worthy to be educators whom the learners deserved to have. 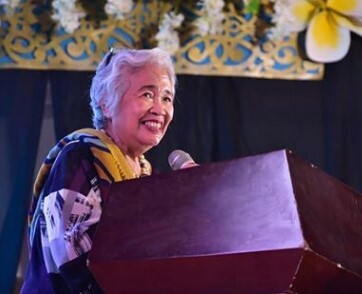 “Because we recognize their fundamental role in educating the Filipino learners and carrying out our reforms at the grassroots, we are relentless in our desire to capacitate and empower our teachers,” said Briones in a DepEd Press Release. 2. Increased teachers' chalk/cash allowance from P2,500 to P3,500. 3. Special hardship allowance to teachers who are assigned in hardship posts, handle multigrade classes, mobile teaching functions, and Alternative Learning System (ALS) coordinators. 6. Increasing poll honoraria, allowances, service credits, and other benefits. That is, P6,000 honoraria for chairperson fo the Electoral Board, P5,000 for members, P4,0000 for DepEd Supervising Official, and P2,000 for support staff. P1,000 additional transportation allowance. 7. Teachers' work load: 6 hours actual classroom teaching and 2 hours teaching-related tasks outside school premises (no verification as proof of services for two hours).